QWERTY packing Motorola WX404 headed to Verizon or Sprint? As we continue to see Motorola appease the broader market audience, there is no shortage of QWERTY based devices to satisfy those individuals who don't need all the refinements on some of their smartphones. Much like how we've seen them create QWERTY messaging devices like the Motorola Clutch i465 or Karma, the latest device to possibly come out of their camp is going to be the Motorola WX404. 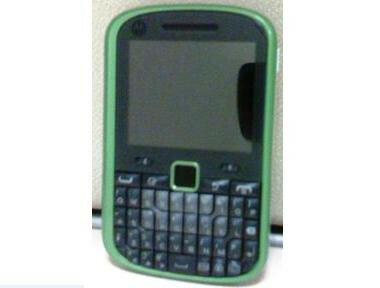 Intended to focus on the entry-level sector, this QWERTY packing handset was spotted over at the Bluetooth SIG and features CDMA connectivity, Bluetooth 2.1, internet browser, 2-megapixel camera, and some multimedia capabilities. The basic premise so far points to either Sprint or Verizon possibly grabbing the device or even one of the many CDMA based prepaid carriers such as US Cellular or MetroPCS. Although Motorola hasn't come out yet to official announce the device, it'll undoubtedly be attached with an affordable price tag which won't break the bank as much. Who says that Motorola needs to focus most of its attention on smartphones all the time? A phone this ugly must be going to Sprint... But Verizon usually has ugly phones too... My vote is that its going to Sprint just for the reason that Sprint tends to get phones with these rediculous colors. Give us Sprinters some more of that Motorola love - we have been waiting for some time for some new smartphones from Motorola and nothing has come to fruition. What gives???? Motorola smartphones are a hit or miss, IMO. The Q was horrible, Q9m I didn't think was a huge improvement. However the Droid is doing quite well. I can't really blame Moto I guess because WinMo was/is not great. OS makes the difference. Where are the Motorola Qwerty phones, on the CDMA network, just like the new iden rugged Motorola i886?